Keynote speeches on transitioning to a digital single market and instituting e-privacy set the discussion narrative for the 2018 Model European Union Blagoevgrad Conference at the forum’s opening ceremony in the House of Europe in Sofia on March 30. A crowded hall heard from AUBG Provost Emilia Zankina, from Mariya Gabriel, EU Commissioner in charge of Digital Economy and Society, who forwarded a special message of encouragement read by Boiko Blagoev, from Ivailo Kalfin, former Deputy Prime Minister, former Member of the European parliament, currently Special Adviser to the EU Budget Commissioner, and Maika Fohrenbach, Policy adviser for the Digital Economy and Intellectual Property at the American Chamber of Commerce to the EU. This year’s MEU conference marked the fourth edition of the forum. 73 participants confirmed their presence, 15 of whom being high school students. 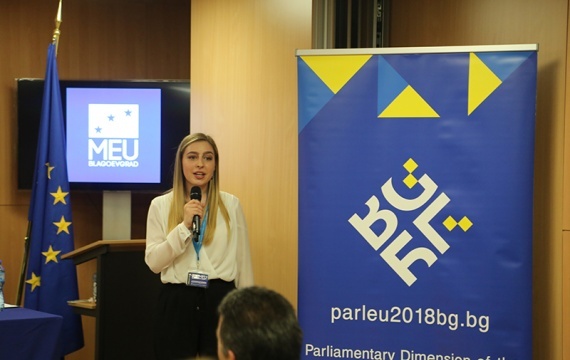 The European Society Club, the student organization behind the simulation, formulated “Moving Towards a Digital Single Market” as the 2018 discussion topic. Following the welcoming talk to all MEU guests by Kristiyana Stoyanova, the club’s president, Zankina began by paying homage to the late Dr. Cosmina Tanasoiu, the founder of the European Studies program at AUBG. She further congratulated the team for providing a testing ground for simulating real-time policy making and diplomatic negotiations. Kalfin continued the talk with and outlay of the European Union’s strategic goals – providing a single market, enabling easier movement, sharing state interdependency, following a common foreign policy and providing added value from creating synergies at international level. He also conditioned the success of the MEU conference on practicing effective decision-making. He also emphasized on the changing responsibilities of the EU delegates in the years leading to 2018. “Approximately 60 years ago the EU needed to adopt foundational geopolitical changes. Today you need an organization that is perceptive to the needs of its 500 million citizens,” he said. Maika Fohrenbach then presented a breakdown of AmCham’s goals in lobbying at the EU. The goal is to be the voice and try to move the case of US companies before commissioners and state representatives consider their stake when making decisions. Another primary motivation is to institute open and fair trade system for companies like Cisco an IBM who face challenges but use data-driven technology innovations to retain their corporate advantage and market share security. Fohrenbach also explained two EU regulation laws - the General Data Protection Regulation (GDPR) and ePrivacy Regulation – that introduce new rights on how to control the use of digital media, broadening the rules for online data communication. She also validated the EU Copyright reform protecting publishing and audio visual services versus technology companies like IBM and YouTube. The MEU 2018 conference continued the following two days on the AUBG campus in Blagoevgrad. Students and other participants had the chance to represent different EU member states, discuss the issues of the day and offer solutions to the challenges the union is facing. 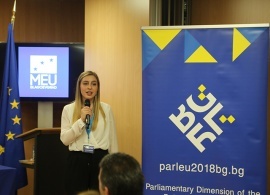 The conference was organized with the support of AUBG, the EU Commission and its Representation in Sofia, the Former Member Association of the European Parliament, the EuropaNova Foundation and the Friedrich-Naumann Foundation .